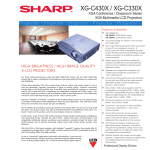 simplifies projector placement in classrooms and meeting rooms, trade show exhibits and other venues with limited space. from an exceptionally short throw distance. x 1200). DTV/HDTV compatibility includes 1080p, 1080i, 720p and 480p. use operation with less maintenance. fan noise and exhaust air. multiple projector management and monitoring for theft protection. power switch in conjunction with the auto restart function. function highlights box or row of information. website for service and support. Lock function and optional security cable kit (for use with ceiling bracket). Joint for ceiling mount; AN-CMCSS16 16" Security Cable System (for use with ceiling mount); AN-CMCSS46 46"
of Texas Instruments. HDMI, the HDMI Logo and High-Definition Multimedia Interface are trademarks or registered trademarks of HDMI Licensing LLC. All other trademarks are the property of their respective owners.